Once each quarter I lead a 2 1/2 hour Restorative Yoga Class. 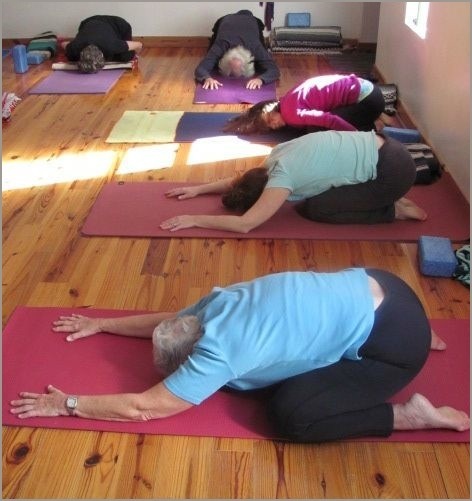 First we warm up with a few standing poses but then we retire to the ground and use lots of blankets and bolsters so that you stay in a pose for a long while without using your musculature to hold you. Slowly the body opens up and you can usually go deeper in a pose than doing it any other way. The whole nervous system slows down and relaxes because it is receiving total support. It’s pretty luscious experience as those of you that have done it know! It is a wonderful way to slow it all down for a few hours, disconnect from the world and reconnect with the quiet place inside ourselves. If you are interested in being on the list of those that I notify when I am offering this, just contact me.